It is now ten years since I took over Crummockwater Cottages: I can’t believe it is so long! I have made a lot of friends and several of the guests who came that first year are still regular visitors: I thank them for their support! I enjoy looking after the Cottages; it is very satisfying to give guests good quality accommodation: I believe a comfortable, clean and friendly place to stay is an important factor in the success of a holiday. I do, of course, have the added ‘wow’ factor of ‘the View’: I do not think anyone can fail to be amazed by it (whatever the time of day or weather). I never forget how lucky I am to be living in such a beautiful place. Everything is now very green and growing fast and the local lane is becoming visibly narrower as the Jack in the hedge and cow parsley start to lean in. 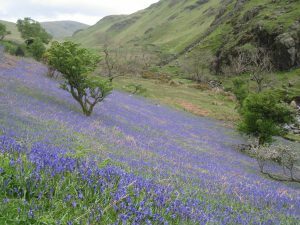 I went along to Rannerdale yesterday afternoon: the bluebells are fantastic this year. There is also a lovely display on a bank on the narrow stretch of road at Lanthwaite: I haven’t been particularly aware of those in previous years but they are stunning. Last weekend my daughter, Clare and her family came for the weekend. We had a lovely family day out on the Friday. 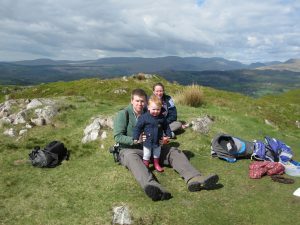 We drove to Eskdale Green and took L’al Ratty to Ravenglass where we picnicked by the sea and then walked back through Muncaster Castle grounds where the rhododendrons were spectacular and then up and over Muncaster Fell! 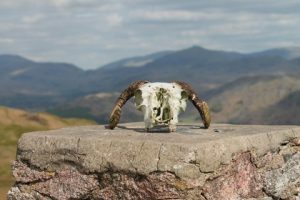 Someone had placed a sheep’s skull on the trig point at the top of the fell which Adam took a photograph of – it looked very impressive with the fells as backdrop. Have you ever found there is sometimes something you are not aware of and then you have two unrelated references in close succession which draw your attention to it? Did you know gorse smells of coconut? I did not, but I do now having walked through and tested shoulder high gorse on the way back to Eskdale Green! It was a great day – one to remember and there was something for everyone! 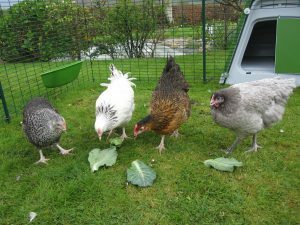 The big news at Foulsyke or should it be Fowl-syke is that I have at last got some chickens – meet from left to right, Doris, Gladys, Marigold and Mabel. Just for the record I heard the first cuckoo on 22nd April – bit earlier than last year.